With summer officially around the corner you might be wondering how your diet should reflect the hot sun and longer days. There are plenty of healthy foods that should be part of your seasonal eating routine. The idea is to cool your body down with strawberries, apples, pears, plums, broccoli, summer squash and even cauliflower. But the patios, campfires and baseball games might tempt you with other popular foods that aren’t so fresh and healthy! So to get your sunny season off to a good start, below are a few of the bad boys you should be careful about this summer. Your backyard picnic table may typically contain a store-bought potato salad. The creamy side dish used to accompany our hotdogs and hamburgers to complete the typical summertime meal. Potato salads from your local grocery often are full of preservatives and chemicals. Potatoes are also generally high on the glycemic index, which can lead to blood sugar spikes and hypertension, heart disease and obesity. I remember the days when the family would take a nice long drive up north to get some fresh corn from a road-side stand. Most people who eat corn on the cob in the summer typically pile on the butter and salt, which adds to your fat and sodium content. However, the main reason you should avoid any corn on the cob is the connection with genetically modified organisms (GMOs). In the United States in 2010, 86% of corn was genetically modified, according to estimates from the California Department of Food and Agriculture. This can cause allergies or sensitivities in some people, so unless you can find organic corn, it’s not your best choice. Lemonade is traditionally known as a refreshing summertime favorite. After doing hard work in the garden or around the house, some freshly squeezed lemonade sounds like a no-brainer, but don’t let it fool you. Lemonade wears a good disguise as it is fruit-based. But in one 8 oz. glass of lemonade there is 25 g of sugar. Lemonade is also a common diuretic, so drinking too much lemonade may lead to dehydration. Some people experience heartburn or tooth sensitivities while drinking a glass of lemonade. Stick with a tall glass of ice water, with a few lemon slices to perk it up. Water is the perfect way to quench your thirst, especially during the summer, and the fresh lemon can be a natural digestive aid as well. 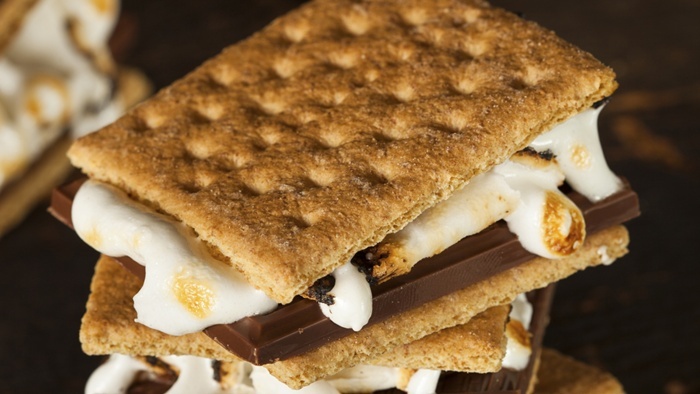 Most good camping stories include the mention of roasting marshmallows over a campfire. There is something special about the gooey taste of a roasted marshmallow. As a young kid, the sugar content of the puffy white snack was the last thing on my mind. That’s part of the problem. There is actually 4 g of added sugar in a medium-sized marshmallow. That’s a hefty amount of sugar considering that campers generally fill their stick with three marshmallows at a time. One campfire alternative is roasting fresh pineapple on a skewer (sticks just won’t work). Sweet and delicious! Hotdogs are considered food favorites and millions are sold every year. Nothing feels more American than baseball and hotdogs. But keep in mind Americans also have a reputation for obesity and heart disease. Hotdogs are processed meat. Virtually all processed meats contain nitrites and are made from factory-farmed animals, which are treated with antibiotics, steroids and hormones. Sodium nitrite has also been shown to increase your risk of cancer. Summer has its traditions, but switch things up with some nourishing, cooling foods to celebrate the season and boost your health. The Institute of Holistic Nutrition, Nutrition and the Environment — Course Notes, (Toronto), 2014, p. 132. Uzoma, K., “Side Effects of Drinking Too Much Lemonade,” LIVESTRONG.com website, Aug. 14, 2011; http://www.livestrong.com/article/518509-side-effects-of-drinking-too-much-lemonade/. “4 Complications Caused by Eating Processed Meat,” FitDay website; http://www.fitday.com/fitness-articles/nutrition/healthy-eating/4-complications-caused-by-eating-processed-meat.html, last accessed June 10, 2014. Ipatenco, S., “How Much Sugar Is in Marshmallows,” SFGate website; http://healthyeating.sfgate.com/much-sugar-marshmallows-4813.html, last accessed June 10, 2014.